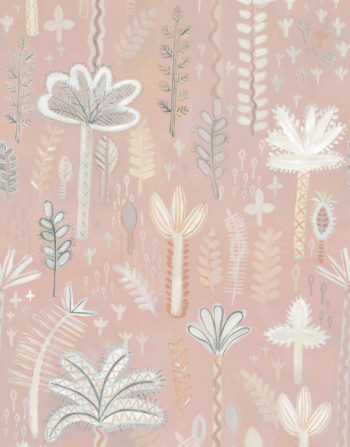 View basket “JAIPUR (STONE) WALLPAPER (10M) A4 SAMPLE” has been added to your basket. 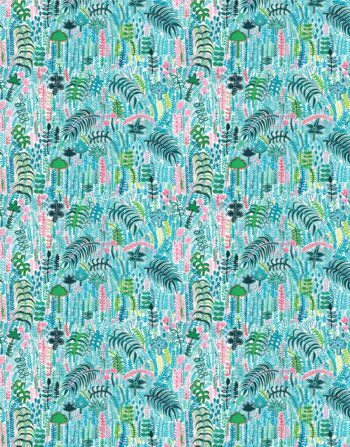 Luscious ‘Lagoon’ has a fresh, tropical palette of verdant greens on a dark base, with hints of rose pink. 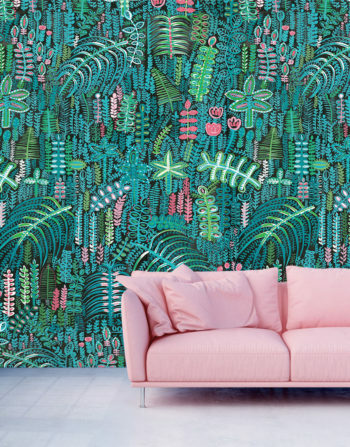 The contemporary, hand painted botanicals flow across the design like a living wall. 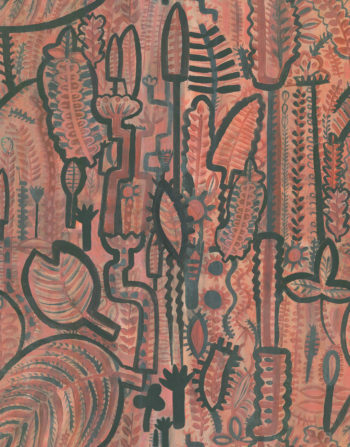 The wallpaper is sold as a single roll comprising 3 x 3m lengths (panel A, B and C) which have been created to sit together to provide a large scale design incorporating a very wide repeat. Each roll is 52cm wide and the three drops together form a repeat design which is of 156cm in width. 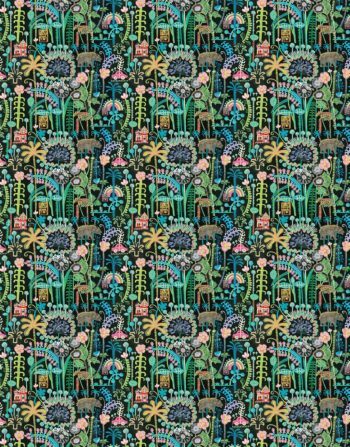 *Please note our wallpapers may take up to 3 weeks to be delivered, but are usually quicker than this. All of our wallpaper samples are A4 in size and show the cut from the selected design shown in the second image. Information including design repeats, roll widths and pack sizes are also included. Designed and printed in the UK. Please note samples are non-returnable. 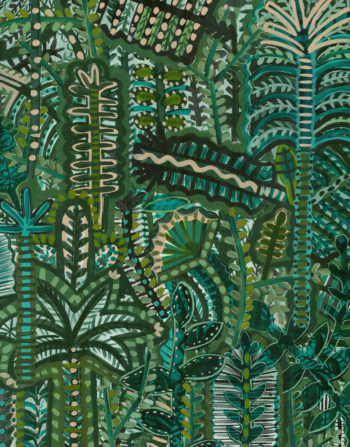 This beautiful and fresh ‘Palm’ wallpaper design began life as a hand painted mural, which has been developed by Lucy in the studio. 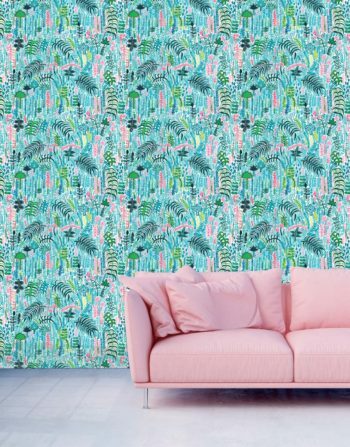 ‘Palm’ wallpaper features a zingy, tropical palette of aquas, teals and limes, with added pops of rose pink florals, on a cool soft white, base. 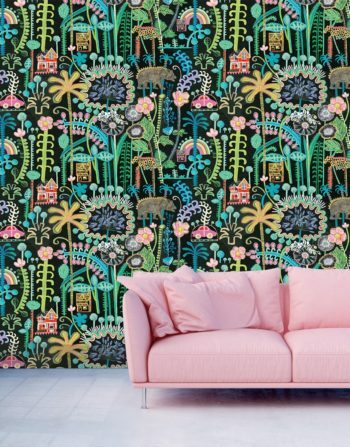 This stunning wallpaper will add allure and impact to many a contemporary interior. 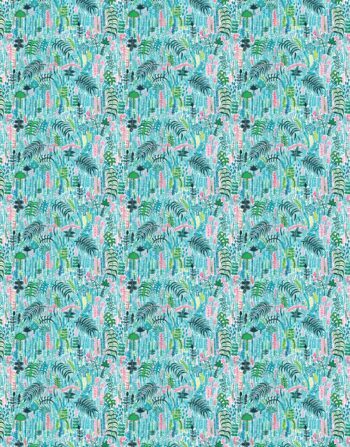 This wallpaper is sold as a set of two rolls (roll A and roll B) which have been created to sit together to provide a large scale design/repeat. Each roll is 70cm wide. 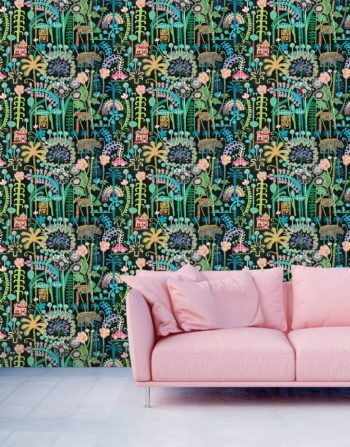 *Please note our wallpapers may take up to 3 weeks to be delivered. 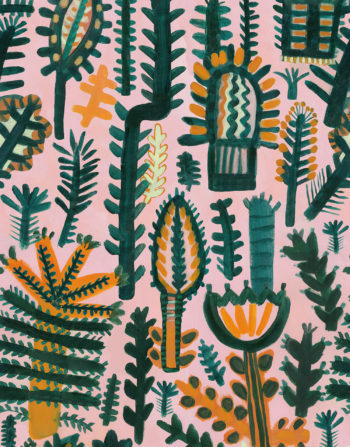 Lucy thoroughly enjoyed hand painting this fresh, colourful design, which is a fantabulous feast for the eyes. 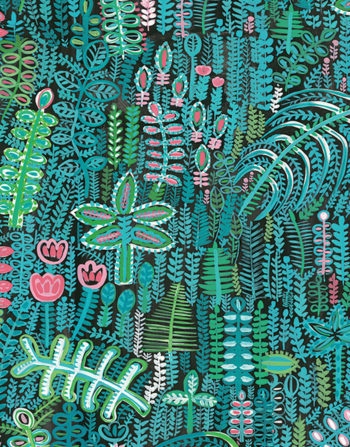 The verdant botanicals and whimsical animal imagery sings along and out of the dark ground. 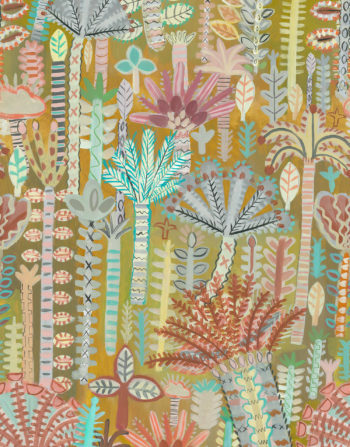 This wallpaper is sold as a set of two rolls (A and B) which sit together to provide a large scale design/repeat. Each roll is 70cm wide. *Photographs of the nursery are from The Innovation House by Sophie Robinson 2018 Ideal Home Show. 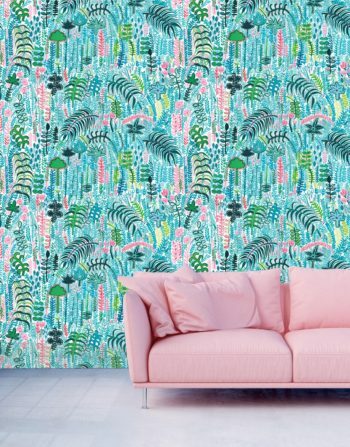 This beautiful ‘Palm’ wallpaper features a zingy, tropical, hand painted palette of aquas, teals and limes, with added pops of rose pink florals, on a cool soft white. It adds allure and impact to many interiors. 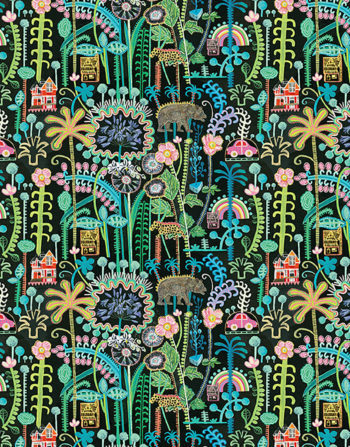 This wallpaper is sold as a single 10m roll. Please email us with your wall dimensions and we can give you an instant quote. 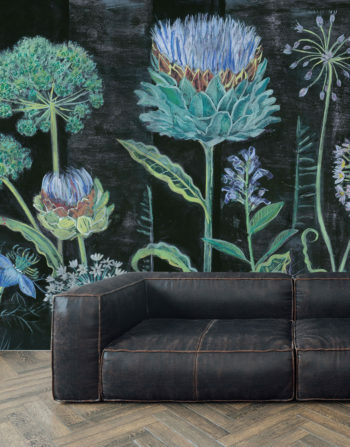 The ‘Allium’ mural design showcases giant hand drawn and painterly botanicals. The paper has a natural matt finish which allows for strong colour representation. Please do contact us if you have any questions or send us your wall dimensions and we can give you a quote. 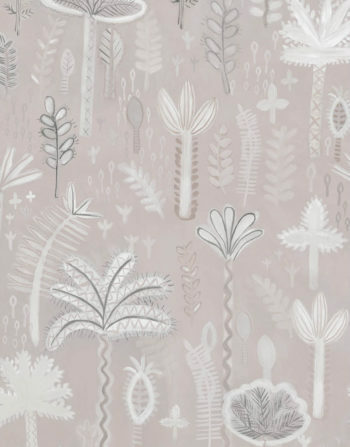 All of our wallpaper samples are A4 in size and show the cut from the selected design. Information including design repeats, roll widths and pack sizes are also included. 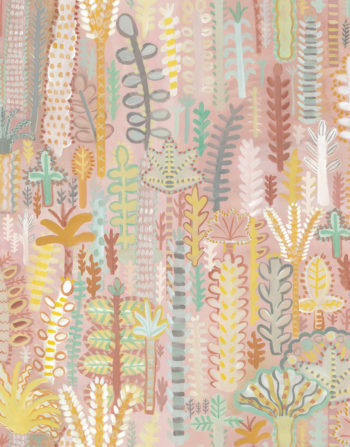 Lucy Tiffney Shop Terms & Conditions.